I'm entering my first ever major painting competition, the Crystal Brush. In it, I am hoping to take with me at least 2 entries. One for Sci-Fi Single Model and one for Fantasy Single model. I doubt I'll have time for anything more. 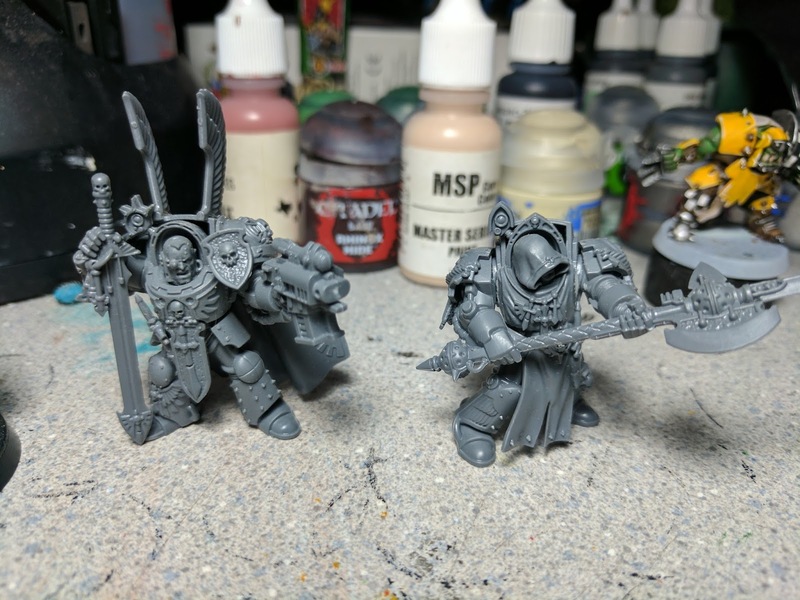 For the Sci-Fi model, I decided to break out an old set of Deathwing Terminators from Warhammer 40,000 and build a Captain out of them. I had already put them together, so it meant breaking some of them apart to use for pieces. This is fine though, since I was probably never going to do anything with them anyway. I built the Captain using a power sword and bolter, originally. But I didn't much care for it. Looking at the power sword, I got the idea of a Captain who was resting and not in combat. But what to do with his left hand? 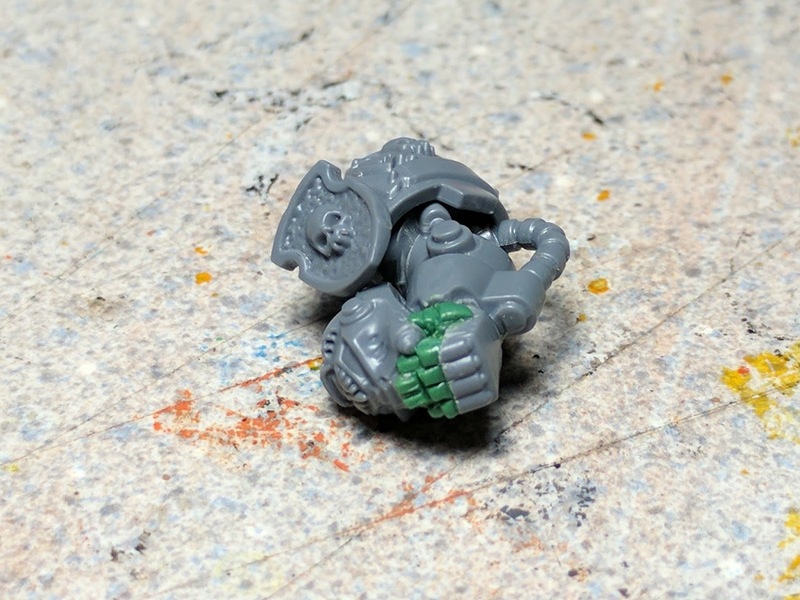 I could have left him holding his bolter, then I though of switching it to an open hand. But there weren't any hands that fit the bill in the kits that I have access to. That's when I thought about having him holding onto his helmet. I knew I wanted the Captain to be unmasked from the beginning, but his original head didn't fit the bill of someone who was standing at ease. I looked around my incredibly tiny collection of Warhammer 40,000 bits for a suitable head and nothing really screamed out to me, until I cracked open my still unassembled Kill Team box set. In there I found the perfect head for him, a bald, grumpy looking dude, with only a stern stare and his mouth closed. Next up, I needed to come up with a way to make him holding the helmet. 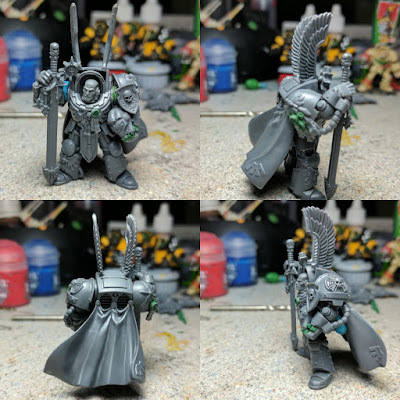 It took a bit of work, and it was actually more than I'd done before, converting models wise. But after sawing apart 3 different arms, and a bit of green stuff, I had his arm all set. It turned out pretty good too, for a guy that doesn't sculpt that often. It did take 2 tries though, my first batch of fingers were really bad. One issue that came up with his arm, was that his shoulder joint wasn't sitting flat any more. The extra bulk added to it, because of the helmet cause it to go on a backward angle. I tried playing with the shoulder pad a bit and the arm, before I glued it down and nothing helped. So a bit more green stuff later and I added in a bit of flex tubing to it to fill the gap. It's a little rough, but I think that it'll look fine once it's painted black and highlighted a little. Finally, I added in some extra badges to his shoulder and one to his chest to break up the symmetry of his chest plate and to give it some extra interest. I knew I couldn't jump right into painting him. I did get him primed though. The bone color of the Deathwing's armor is a slightly tough color to work with, that's why I started doing the tests that I posted about earlier. I knew I couldn't go to Crystal Brush with my old style of painting their armor. 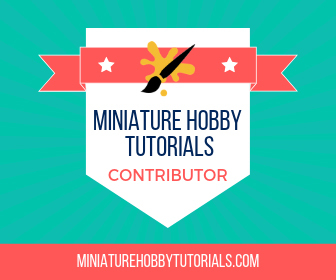 I would need to up my quality and work in some deep shadows and bright highlighting. So while I was waiting for coats of primer to dry on the big guy, I started working on a new test piece. 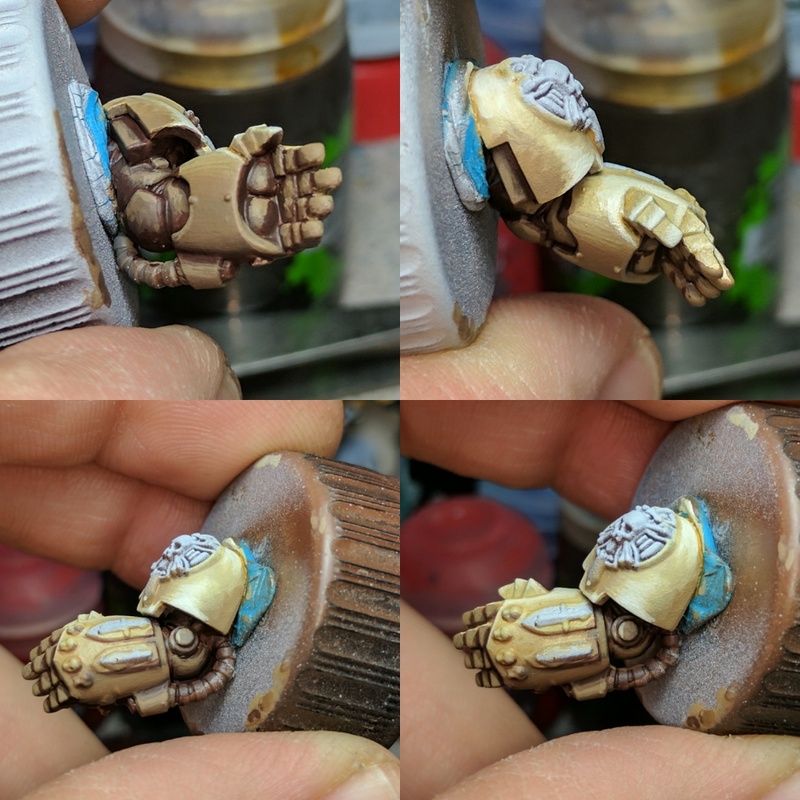 This time I grabbed a power fist and went to town on it. 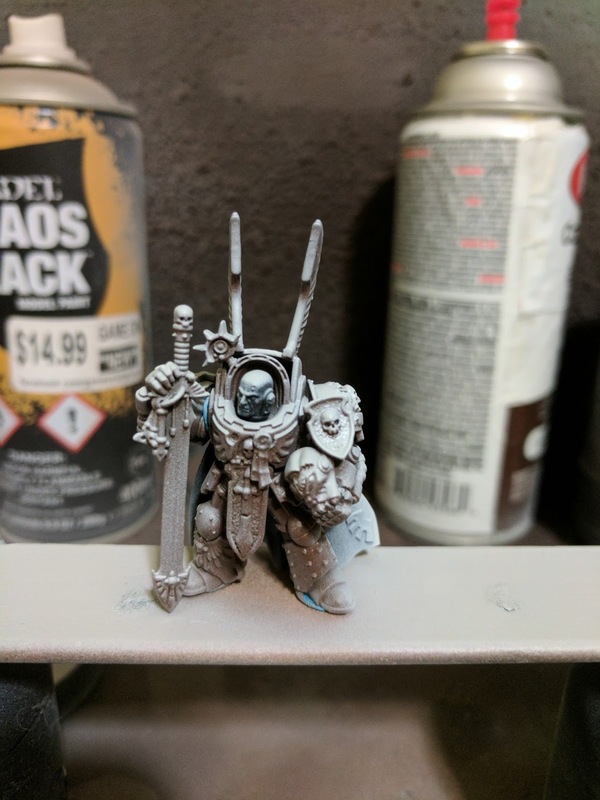 I dual primed it, like I was planning to with the actual mini (and the last test), and then I painted in the shadows with Steel Legion Drab. Last night's test used XV-88 for the shadow color. I needed something darker and I though Steel Legion Drab was the ticket. After messing with it and doing all the highlighted areas, I decided I needed to go darker still. So I pushed aside my usual timidness to push contrast and went right for Rhionx Hide, the darkest brown I own. I painted all other shadowed areas, recesses and undersides with Rhinox Hide. Then I began highlighting it back up with Steel Legion Drab. I needed to use Steel Legion Drab in the mix, because I had already used it as the basis of my darker sections of the bright areas. This ended up working out well too. I slowly mixed in more Steel Legion Drab to the Rhionx Hide and then in only the brightest spots I added in some Ushbati Bone. I really like the results. The lit areas seem brighter and the shadow areas seem more natural. I do need to focus on smoother transitions of shades and better blends in some areas, both lit and shaded. But I feel that I am ready to get to work on the actual model now. Hopefully he turns out as well as I hope. Keep an eye peeled. I'll be posting more progress here, on Twitter and on Instagram!